References PP_PropertyMap::linestyle_none, m_dShadingOffset, m_dThickness, m_sDefaultStyle, UT_convertToInches(), and UT_std_string_sprintf(). References DELETEP, m_pBorderShadingPreview, and stopUpdater(). References m_pBorderShadingPreview, XAP_Preview::setWindowSize(), and UT_return_if_fail. Referenced by AP_Win32Dialog_Border_Shading::_onInitDialog(), and AP_UnixDialog_Border_Shading::runModeless(). Referenced by AP_Win32Dialog_Border_Shading::setShadingOffsetInGUI(), and AP_UnixDialog_Border_Shading::setShadingOffsetInGUI(). Referenced by setBorderThickness(), AP_Win32Dialog_Border_Shading::setBorderThicknessInGUI(), and AP_UnixDialog_Border_Shading::setBorderThicknessInGUI(). References LS_OFF, m_vecProps, PP_getAttribute(), and UT_std_string_sprintf(). Referenced by getBottomToggled(), getLeftToggled(), getRightToggled(), and getTopToggled(). References XAP_Dialog::getApp(), XAP_Frame::getCurrentView(), XAP_App::getLastFocussedFrame(), m_bSettingsChanged, m_vecProps, FV_View::setBlockFormat(), and UT_DEBUGMSG. Referenced by AP_Win32Dialog_Border_Shading::_onCommand(), and s_apply_changes(). References UT_Worker::getInstanceData(), m_bAutoUpdate_happening_now, m_bDestroy_says_stopupdating, setAllSensitivities(), setCurBlockProps(), and UT_return_if_fail. References XAP_Dialog_Modeless::BuildWindowName(), FREEP, gchar, XAP_Dialog::getApp(), XAP_App::getStringSet(), XAP_StringSet::getValue(), m_WindowName, and UT_XML_cloneNoAmpersands(). Referenced by AP_UnixDialog_Border_Shading::_constructWindow(), AP_Win32Dialog_Border_Shading::activate(), AP_UnixDialog_Border_Shading::activate(), AP_Win32Dialog_Border_Shading::notifyActiveFrame(), and AP_UnixDialog_Border_Shading::notifyActiveFrame(). Referenced by AP_Win32Dialog_Border_Shading::_onDlgMessage(), AP_Win32Dialog_Border_Shading::destroy(), and AP_UnixDialog_Border_Shading::destroy(). Referenced by AP_UnixDialog_Border_Shading::_constructWindow(), AP_Win32Dialog_Border_Shading::_onInitDialog(), AP_Border_Shading_preview::draw(), AP_Win32Dialog_Border_Shading::setSensitivity(), and AP_UnixDialog_Border_Shading::setSensitivity(). Sets the sensitivity of the radio buttons to top/bottom/left/right line buttons Call this right after constructing the widget and before dropping into the main loop. Referenced by AP_Win32Dialog_Border_Shading::_onInitDialog(), AP_UnixDialog_Border_Shading::_populateWindowData(), AP_Win32Dialog_Border_Shading::activate(), AP_UnixDialog_Border_Shading::activate(), autoUpdateMC(), AP_Win32Dialog_Border_Shading::notifyActiveFrame(), and AP_UnixDialog_Border_Shading::notifyActiveFrame(). References UT_RGBColor::m_blu, m_borderColor, m_bSettingsChanged, UT_RGBColor::m_grn, UT_RGBColor::m_red, m_vecProps, PP_addOrSetAttribute(), s, UT_std_string_sprintf(), and xxx_UT_DEBUGMSG. Referenced by AP_Win32Dialog_Border_Shading::_onCommand(), and s_on_border_color_clicked(). References m_bSettingsChanged, m_vecProps, and PP_addOrSetAttribute(). Referenced by AP_Win32Dialog_Border_Shading::_onCommand(), and AP_UnixDialog_Border_Shading::event_BorderStyleChanged(). References _findClosestThickness(), m_bSettingsChanged, m_dThickness, m_sBorderThickness, m_vecProps, PP_addOrSetAttribute(), UT_std_string_sprintf(), and xxx_UT_DEBUGMSG. Referenced by AP_Win32Dialog_Border_Shading::_onCommand(), and AP_UnixDialog_Border_Shading::event_BorderThicknessChanged(). References BORDER_SHADING_SHADING_DISABLE, XAP_Dialog::getApp(), FV_View::getCurrentBlock(), XAP_Frame::getCurrentView(), XAP_App::getLastFocussedFrame(), FV_View::getPoint(), fl_BlockLayout::getProperty(), m_bSettingsChanged, m_iOldPos, m_pBorderShadingPreview, m_sDefaultStyle, m_vecProps, PP_addOrSetAttribute(), PP_removeAttribute(), XAP_CustomWidget::queueDraw(), setBorderColorInGUI(), setBorderStyleInGUI(), setBorderThicknessInGUI(), UT_RGBColor::setColor(), setShadingColorInGUI(), setShadingPatternInGUI(), and xxx_UT_DEBUGMSG. References UT_RGBColor::isTransparent(), UT_RGBColor::m_blu, m_bSettingsChanged, UT_RGBColor::m_grn, UT_RGBColor::m_red, m_vecProps, PP_addOrSetAttribute(), PP_removeAttribute(), UT_std_string_sprintf(), and xxx_UT_DEBUGMSG. Referenced by AP_Win32Dialog_Border_Shading::_onCommand(), and s_on_shading_color_clicked(). Referenced by AP_Win32Dialog_Border_Shading::_onCommand(), and AP_UnixDialog_Border_Shading::event_ShadingOffsetChanged(). References m_bSettingsChanged, m_vecProps, PP_addOrSetAttribute(), and xxx_UT_DEBUGMSG. Referenced by AP_Win32Dialog_Border_Shading::_onCommand(), and AP_UnixDialog_Border_Shading::event_shadingPatternChange(). Referenced by finalize(), and ~AP_Dialog_Border_Shading(). References LS_OFF, UT_RGBColor::m_blu, m_borderColor, m_bSettingsChanged, UT_RGBColor::m_grn, m_lineStyle, UT_RGBColor::m_red, m_sBorderThickness, m_vecProps, PP_addOrSetAttribute(), toggle_bottom, toggle_left, toggle_right, toggle_top, UT_std_string_sprintf(), and xxx_UT_DEBUGMSG. Referenced by AP_Win32Dialog_Border_Shading::_onCommand(), s_line_bottom(), s_line_left(), s_line_right(), and s_line_top(). Referenced by AP_Win32Dialog_Border_Shading::_onCommand(), AP_Win32Dialog_Border_Shading::event_Close(), AP_UnixDialog_Border_Shading::event_Close(), and getAnswer(). Referenced by setBorderColor(), and toggleLineType(). Referenced by applyChanges(), setBorderColor(), setBorderStyle(), setBorderThickness(), setCurBlockProps(), setShadingColor(), setShadingPattern(), and toggleLineType(). Referenced by _findClosestOffset(), AP_Dialog_Border_Shading(), and AP_UnixDialog_Border_Shading::event_ShadingOffsetChanged(). Referenced by _findClosestThickness(), AP_Dialog_Border_Shading(), AP_UnixDialog_Border_Shading::event_BorderThicknessChanged(), and setBorderThickness(). Referenced by _createPreviewFromGC(), AP_Win32Dialog_Border_Shading::_onInitDialog(), AP_Win32Dialog_Border_Shading::event_previewExposed(), AP_UnixDialog_Border_Shading::event_previewExposed(), AP_UnixDialog_Border_Shading::runModeless(), setCurBlockProps(), and ~AP_Dialog_Border_Shading(). Referenced by setBorderThickness(), and toggleLineType(). Referenced by AP_Dialog_Border_Shading(), and setCurBlockProps(). Referenced by _getToggleButtonStatus(), applyChanges(), setBorderColor(), setBorderStyle(), setBorderThickness(), setCurBlockProps(), setShadingColor(), setShadingPattern(), and toggleLineType(). 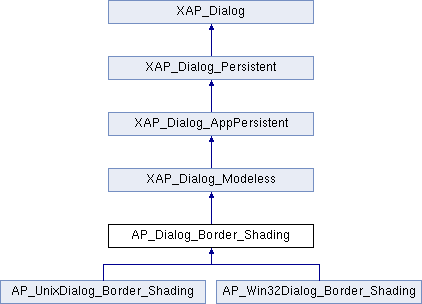 Referenced by AP_UnixDialog_Border_Shading::_constructWindow(), AP_UnixDialog_Border_Shading::activate(), ConstructWindowName(), AP_Win32Dialog_Border_Shading::notifyActiveFrame(), and AP_UnixDialog_Border_Shading::notifyActiveFrame().